We have been cleaning aquariums & cleaning ponds in the Melbourne area for 25 years. To keep your aquarium healthy it must be serviced regularly. Our standard service is every four weeks. We also offer custom servicing for more regular or casual clients and complete overhauls for aquariums in poor condition. The build-up of biological toxins requires water changes. Biological toxins primarily come from fish waste, decaying plants or uneaten fish food. Bacteria reduce these deadly bi-products to less harmful substances - nitrates. Nitrates accumulate in the aquarium, leading to poor fish & plant health, algae, and anearobic conditions. Most fish tanks have levels at least 2 to 3 times above the ideal limit. 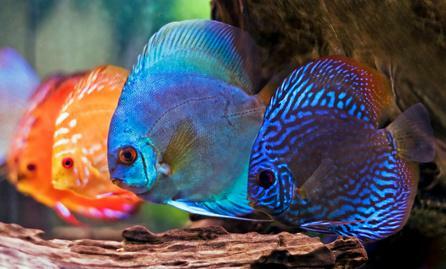 There are also many other water parameters that must be kept within a range for a "healthy aquarium". Our regular servicing schedule includes testing and adjusting within the ideal parameters, ensuring a healthy aquatic environment for the aquarium. Whether your pond requires total cleaning or a pond management program, we have the experience and equipment to do the job. Regular servicing is vital to pond health, removing biological toxins and accumulated nutrients. The toxins stunt fish growth and also stop fish breeding, while the nutrients feed algal growth. Eventually the pond could become so toxic the fish will die off and animals or humans coming into contact with the water may become sick. We offer many servicing options including pond management, complete cleaning, regular services and also our unique environmental friendly service. This is for clients who prefer their ponds algae problems be treated using natural products, rather than toxic chemicals. The right hardware and its working condition is essential for a healthy pond. Your pump and filter will be thouroughly serviced every visit. Do you want clear water every day? We have many happy customers with clean, clear and healthy ponds. Book a consultation today and we will complete an assessment of your pond. Please email us for information sheets on pond management or complete cleaning. Advice on algae problems, fish breeding, filter cleaning, pump replacements, water lily growth, pond covers etc. Sales of pond equipment. Advanced water testing, bacteria populations, flow rates, hardware capabilities etc. Aquariums and stands made to order, including all hardware. Catering for shows, displays, television productions, weddings etc. Delivery, setting up and removal of aquariums or fish bowls. Quality conditioners, fish foods, algae treatments etc.